Oh No, Rudy Giuliani Says the Mueller Probe Might End by September, Trump Will Get so Bored! 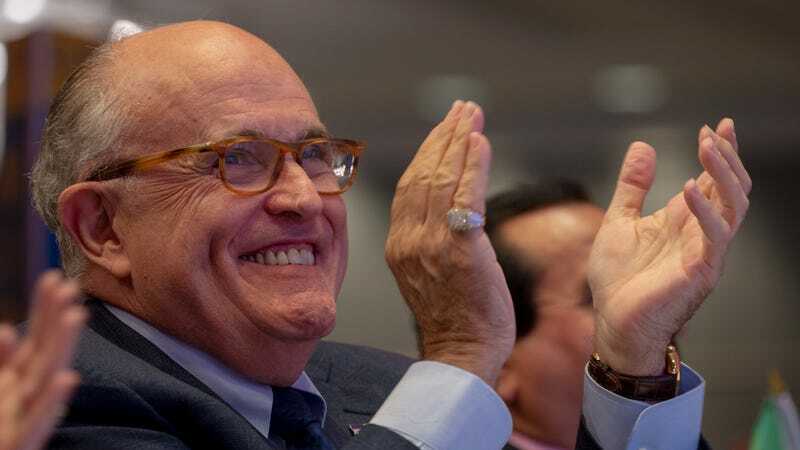 Rudy Giuliani, who keeps popping up on my TV no matter how many times I spray it with Raid, is now heading Donald Trump’s legal team, for we are trapped in an endless loop of ‘90s cut-for-time sketches. But Rudy says we won’t be stuck with him for long—he expects Mueller’s probe will conclude by September 1, which is very soon! Sadly, if he’s right, this means my family will have to find something else to fight over at Thanksgiving, and also that Trump will have to find something new to make unhinged tweets about. What to do! With the magnificent Rudy/Trump dream team practicing hard for Trump’s very big alleged interview with Special Counsel Robert Mueller this summer, Giuliani continues to flap his worm lips at the press, telling the Associated Press on Sunday that he recently saw a Russia probe timetable that had Mueller submitting his final report to Congress well before the 2018 midterm elections in November. “We said to them, ‘If we’re going to be interviewed in July, how much time until the report gets issued?’” Giuliani told the AP. “They said September, which is good for everyone, because no one wants this to drag into the midterms.” Indeed, just imagine what chaos might ensue if a big investigation plopped out of the air right before a major election! According to the New York Times, Mueller’s presentation of the report to Congress won’t exactly spell the end of the Russia investigation as a whole, but merely the investigation into potential obstruction of justice. But by floating a deadline, Giuliani’s trying “to publicly pressure Mr. Mueller to stick to that timeline,” as well as to “assuage the president by predicting the inquiry will end soon,” per the Times. Not that that appears to be working, by the looks of Trump’s Twitter account. Certainly, the probe’s conclusion will be good for Trump’s mental state, since his obsession with it seems to be cutting into his time with his special Fox & Friends stories. On the other hand, what will he tweet about? And what will he inappropriately capitalize and/or punctuate? In fact, Trump appears to have found a way to prolong his online screaming—by demanding an investigation into the Russia investigation! All by himself! Like a big boy! Meanwhile, Giuliani has still not confirmed whether Trump will actually sit for an interview with Mueller in July. They’ll make an official decision sometime after the president meets with North Korean leader Kim Jong Un in June, assuming we’re not all reduced to nuclear ash by then. Trump Reportedly Complains About the Russia Probe 20 Times a Day, Which Seems Like a Lot?